First – it is NOT your average golf round. 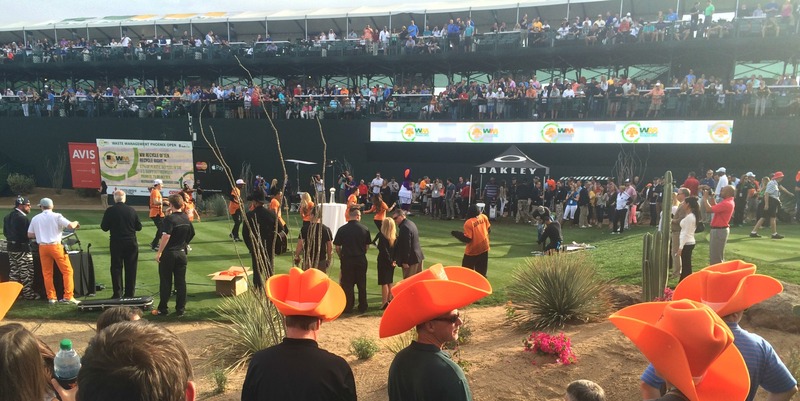 It is notoriously known for fans rowdy behavior, noise levels which would be taboo on any other course. 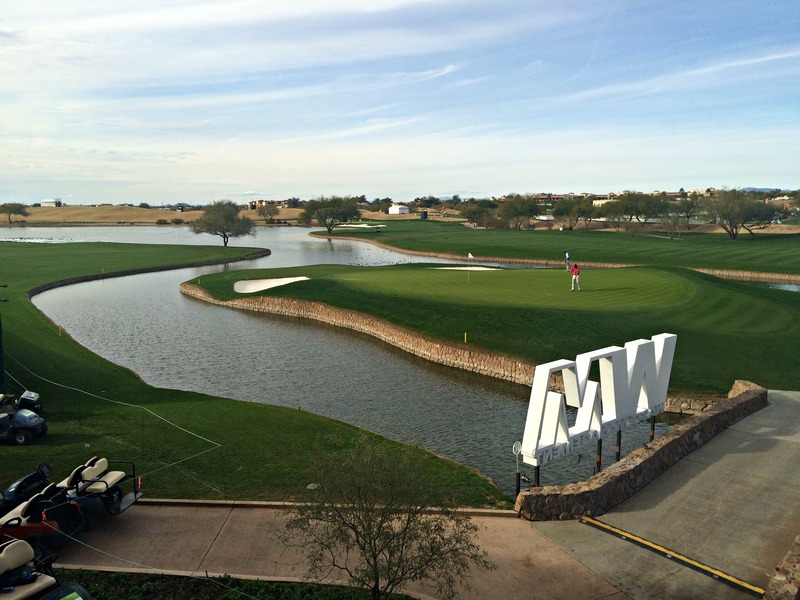 This hole is iconic for its atmosphere – more like a football game, than golf. Skyboxes and Loge passes are $45,000-$150,000. 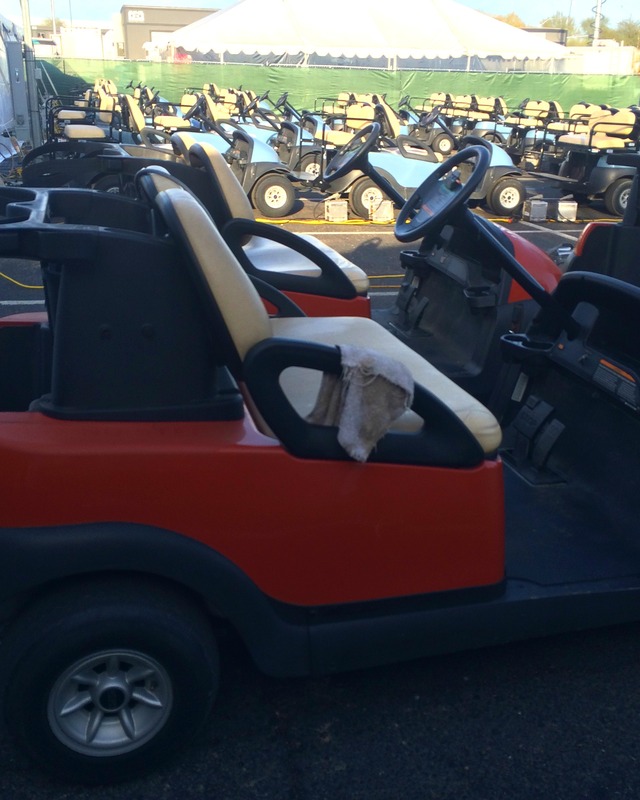 I began today by picking out my new set of wheels…. Just to set the stage a little bit. Scottsdale, Arizona is absolutely GORGEOUS. I had the pleasure of driving into Scottsdale during sunrise this morning, and the sky was cotton-candy colored while the mountains were a grey/purple. Cameras don’t to desert colors justice. 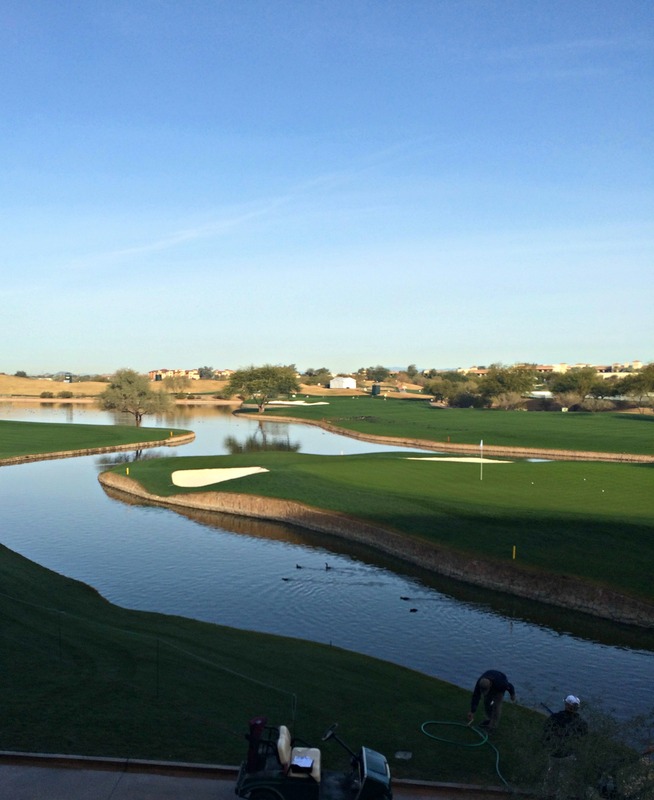 The golf course is as prestigious as you would imagine from a nationally-televised sporting event. The holes have large stadium seats and skyboxes with elaborate buffets, desserts and coffees, and of course full bars throughout. First let me mention that I have never played or watched a golf event unless mini golf at Fiesta Village counts. Even in my interview for this position, I straight-up admitted that I was not very familiar with golf. But I was excited about an opportunity to learn about the behind-the-scenes business aspect of a new sport! So my expectations for this Open were: very quiet crowds of people, lined around the course. Stuffy “golf claps.” Silly golf outfits. But the atmosphere of the spectators was far from stuffy or quiet. It was a 100,000 guest P-A-R-T-Y. The music was blasting, the drinks were flowing, the entertainment was constant. The “shot at glory” on Hole 16 was a treat! 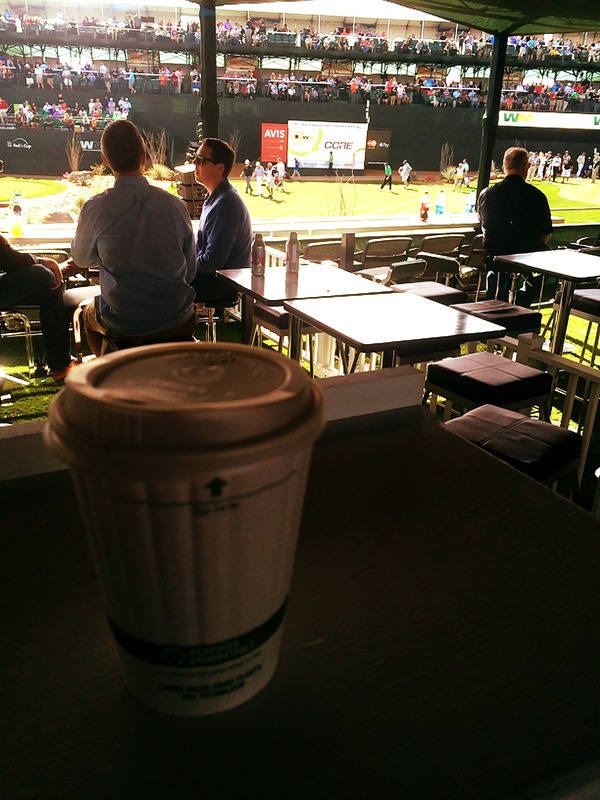 We stood in the skyboxes, looking down at professional athletes, businesspeople, and celebrities swing on the green. My personal highlights were Jake Owen, Larry Fitzgerald, and the tall cute guy from Lady Antebellum (I don’t know his real name…). I watched Tiger putt on Hole 15 and fall apart on Hole 16. I learned who Phil Mickelson is, and apparently missed Tim Tebow autographs by a few minutes. I’m not a star-struck person, because when you see Tiger Woods in real life he just looks like a normal person. But it was pretty cool to have such an out-of-the-ordinary day (on a school day!) and I can’t wait to see what tomorrow brings! Posted on January 28, 2015, in College, Fitness, Healthy Habits and tagged arizona, celebrity sighting, college, fitness, golf, golf course, intern, pga, pga tour, phoenix, phoenix open, pro am, scottsdale, sports marketing, tiger woods, waste management phoenix open. Bookmark the permalink. 4 Comments. Great entertaining report. Love you blog. How fun! What a great opportunity!! Good for you! YOU GO GIRL…………SO NICE TO SEE YOUR ENJOYING LIFE AND ALL THE NEW EXPERIENCES !! TELL YOUR MOM AND DAD …HI ! !